Lots of people know the Auvergne, but don’t really know it as they pass through the area without making a stop there. We have decided for that reason to make it a feature. We would recommend you try our Motorhome Holiday Auvergne Region package. It is a quiet rural area where very little English is spoken. The Auvergne includes part of the Massif Central. 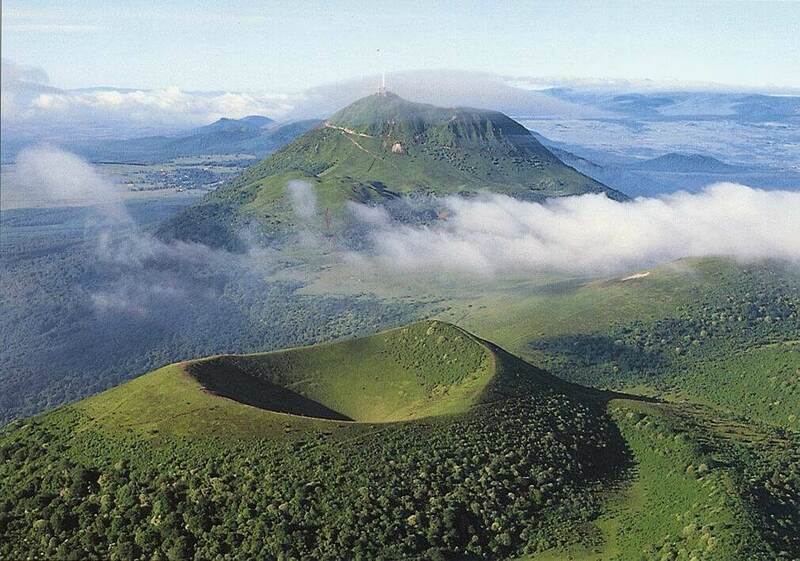 It also encompasses the Parc natural regional des Volcans d’Auvergne- Auvergne Volcanoes Regional Park. The park was established in 1977 and is the largest of its kind in Europe. There are four chains of about 80 extinct volcanoes that were active between 7000 and 10,000 years ago. They really look like volcanoes too. They have pyramidal cones and a crater in the centre where the lava once poured out. The volcanoes, known as puys dominate this gorgeous landscapeof huge open skies above wooded slopes. You can find campsites high up around beautiful atmospheric lakes. The area is also a hotspot for hiking, cycling, riding, climbing and hang-gliding. 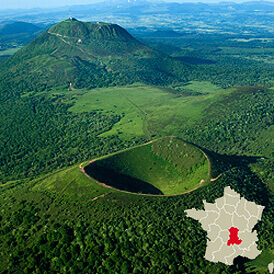 Auvergne Volcanoes Regional Park is compact enough to visit in a series of day trips during a week’s stay. You can still be back on site for a swim in the pool or just enjoy your relaxation. The Auvergne is about an eight hour drive from Calais. Clermont Ferrand is the Auvergne’s principal city and home to the Michelin tyre company. 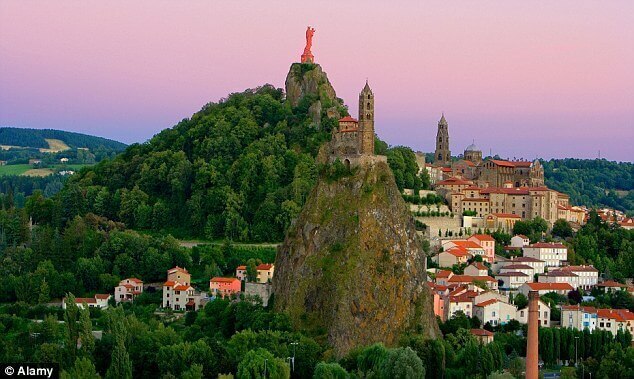 The city is very modern and situated on a flat plain with the mountains, particularly the Puy de Dome towering above. If you drive half an hour from here you will climb into the mountains through quaint French towns. You will see the breathtaking scenery of the regional park itself. Many of the lakes and towns are situated as high as 3000 ft (914m). Up here the sun is strong and the weather gentle. The area can get a lot of rain overnight. Cloud is common in the early morning but afternoons are often filled with glorious sunshine. The Auvergne scenery is divine and the laid back pace of life relaxes you from day one. In winter it is a major ski area. In summer the mountain tops are clear, although snow can linger on some of the highest peaks into July. The highest peak in the region is Puy du Sancy at 6184 ft (1885m). A splendid peak soaring in to the French skies. If you have general hill walking and map reading skills you should have no problems reaching the top. South of Le Mont-Dore a road climbs to the Station du Mont-Dore. Here there is car parking,shops and cafes. From this location the cable car whisks you dramatically up to the cafe a few hundred feet below the summit. However, if you enjoy adventurous hill walking, then the best way up the Puy de Sancy is to follow the track from the car park that takes you up Val de Courre among the towering rock spires. This climbs to join the GR30 Long Distance Footpath, with an excellent track that stretches along the ridge line to join the main path to the summit close to the cafe. The summit itself has been eroded by the thousands of people who climb to it from the top of the cable car so there’s now a long line of wooden steps to the top. The quickest way back down is to take the GR4E path that follows a ski road back to the car park, or you could opt for the tougher high level route north over the Puy de Cacadogne and the Roc de Cuzeau. The shorter circuit will be enough for most and give you time to explore Le Mont-Dore afterwards. So after climbing central France’s highest peak what else is there to do? Well, to view those volcanoes properly you should drive to the Puy de Dome, the showpiece for the regional park which is visible from all over the Auvergne. The views from it’s 4869 ft (1483m) summit are incredible in all directionns- Clermont-Ferrand, spread out like a map below looks amazing and there’s also the ruins of a Gallo-Roman temple dedicated to Mercury. For most of the year you can drive to the summit but during the main tourist season, and at weekends, it is closed to cars to avoid congestion. There is a reasonably priced shuttle bus to the top. If you’re feeling energetic you can take a walk down on good tracks, but the bus journey down is spectacular. Take a map and try to identify the volcanoes you see below. Another good outing is to follow the D983 and cross the Col de Guery. Make sure you stop at the pass as the scenery is breathtaking-huge rock faces tower into the sky and solidified walls abound. You will see this gorgeous igneous rock everywhere. It is mostly pink but can be black too. From the Col de la Croix-Morand ou de Dyane a great high level ridge heads south along several high summits on a magnificent path that crosses the Puy de la Tache and carries on to the Puy de l’Angle with its iron cross and fabulous views of the sancy Massif. Now you can descend to the Col de la Croix St Robert and take a path back to Le Mont-Dore passing theb populat 200 ft (61m) waterfall of the Grand Cascade. From Le Mont-Dore we would recommend catching a taxi back to your car to save a long walk back along the road. You could also choose to enjoy this lovely area by hot air balloon.